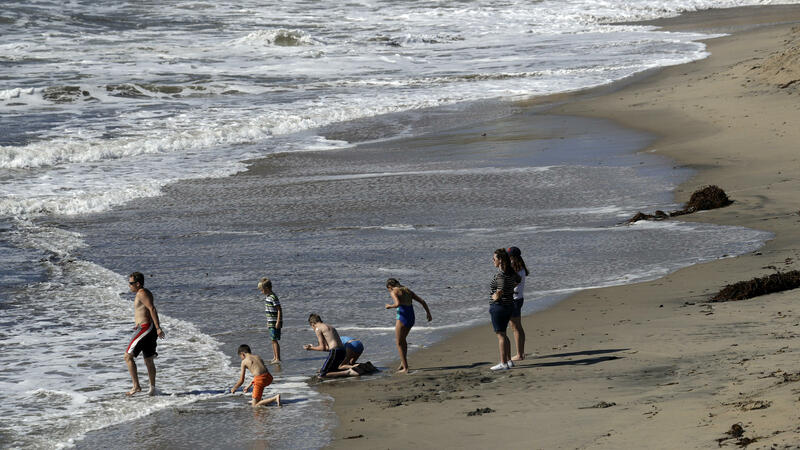 California legislators passed the California Coastal Act in 1976 as a way to protect the state's famed shoreline and to enshrine beach access for all. But that landmark law has spawned a nearly five-decade-long tug-of-war between the state and private property owners. Now, two highly-publicized legal skirmishes — including one pending before the U.S. Supreme Court — have coastal advocates worried. Santa Barbara native Joshua Brown practically grew up in the ocean waves here in California's picturesque Santa Barbara County. "I started surfing when I was about 11-years-old and I spent a lot of time in the water swimming, kayaking, surfing — being very comfortable in the ocean," said the 26-year-old resident of Kernville. So Brown didn't hesitate in 2010 when friends invited him to strap his surfboard to a kayak and paddle more than two miles to the coveted shores of Hollister Ranch — a community renowned for its legendary waves and pristine coastline. "It's insanely beautiful," Brown said. "There's otters, there's all kinds of sea life." The 14,500-acre Hollister Ranch is a subdivision of mostly 100-acre lots, owned by wealthy surfers and celebrities. The Ranch is private, gated and patrolled by security guards. Beach trails within the ranch are off-limits to the public. And that's exactly how Hollister land owners would like it to stay. They have been fighting to keep their beach private for decades. In the most recent battle, land owners filed a lawsuit in 2013 challenging the state of California's claim to an easement that provides the only public access by land to a small beach within the famed ranch. Last December, the parties quietly struck a legal settlement — without public input or public knowledge — that would have California extinguish the land-based access claim. In exchange, Hollister owners would open up a narrow strip of beach to the public, but only to those willing to risk the ocean journey by small craft, such as kayaks, paddleboards or soft-bottom boats. "It's completely unfair, it's unreasonable and I'm really surprised the state would agree to such a settlement that exposes the public to significant risk," said Susan Jordan, executive director of the California Coastal Protection Network. "The general member of the public would not be able to manage this and I would advise them not to even try to do it." The afternoon winds during his 2010 trip snuck up during his paddle home, turning the placid ocean surface into a roiling mass of whitecaps. The winds flipped his kayak and blew his companions far beyond the shore. Thankfully, he said, surfers passing in a motor boat helped tow them back safely. "We understood the ocean but it ended up becoming a very dangerous trip," Brown said. Geography and weather make the ocean trek 'unpredictable and treacherous,' said Marc Chytilo, an attorney for the Gaviota Coast Conservancy and the Gaviota Coastal Trail Alliance, a collection of coastal advocacy groups now challenging the pending settlement. "It goes past four canyons which are notorious for having off-shore winds blowing under sundowner conditions," Chytilo said of the ocean trek from Gaviota State Park to the Cuarto Canyon beach at the Hollister Ranch. "Twenty-five to 40-mile-an-hour winds come out of those canyon mouths." In May, Santa Barbara Superior Court Judge Colleen Sterne gave the settlement preliminary approval, subject to public notification and the opportunity for any interested party to intervene in the lawsuit. Coastal advocates and hundreds of Californians have sent emails to the California Coastal Commission contending that ocean-only access is tantamount to no access at all. And that, Chytilo says, violates California law. "The California constitution and the Coastal Act provide that the public's right to access the ocean cannot be denied," he said. California Coastal Commissioner Aaron Peskin said the proposed legal settlement, brokered by the State Attorney General's office "wasn't ideal but we were making the best of a bad situation." "The good news is that the public has weighed in: over 1,500 individuals have sent emails," Peskin said. "They've all been heartfelt and that's really refocused the commission on the longer term goal of getting real public access, not only by water and not only by small groups to Hollister ranch." The Hollister Ranch Owners Association would comment only by written statement. The group characterized the pending settlement, which also includes the expansion of an existing tide pool program for students and of limited tours for certain non-profit groups as "fair and reasonable." "We believe the settlement reflects an appropriate balance of interests – including managed public access to the beach and the continued privacy and security of the Ranch residents," Monte Ward, president of the Hollister Ranch Owners Association said in the written statement. "It also assures that the valuable natural resources along the coastline will be respected and protected into the future." The judge will decide whether to give final approval to the settlement after a final hearing on Sept. 10. Meanwhile, near San Francisco, Silicon Valley billionaire, Vinod Khosla, has been fighting for years to block the beach-going public from crossing his land. After losing in the state's lower courts, the Sun Microsystems co-founder is now asking the U.S. Supreme Court to hear his challenge to the California Coastal Act. That challenge puts the landmark law at risk, said Richard Frank, director of the California Environmental Law and Policy Center at the University of California at Davis School of Law. "The U.S. Supreme Court has been very concerned about private property rights, particularly as they bump up against coastal access concerns, pretty much since the creation of the California Coastal Act," he said. If the conservative-leaning high court agrees to hear the case, Frank says, private property rights could win out and limit how California manages its nearly one-thousand-mile coastline. In 1976, California's lawmakers passed the California Coastal Act to help protect the state's shoreline and enshrine beach access for all. That landmark law has spawned a nearly five-decade-long tug of war between the state and private property owners. Now two highly publicized legal fights, including one pending before the U.S. Supreme Court, have coastal advocates worried. Stephanie O'Neill has the story. STEPHANIE O'NEILL, BYLINE: Santa Barbara native Joshua Brown practically grew up in these ocean waves here in California's picturesque Santa Barbara County. JOSHUA BROWN: I started surfing when I was about 11 years old. And I spent a lot of time in the water - swimming, kayaking, surfing, being very comfortable in the ocean. O'NEILL: So he didn't hesitate in 2010 when friends invited him to strap his surfboard to a kayak and paddle more than two miles to the coveted shores of Hollister Ranch, a community renowned for its legendary waves and pristine coastline. BROWN: It's insanely beautiful. There's otters. There's all kinds of sea life. O'NEILL: The subdivision of mostly 100-acre lots owned by wealthy surfers and celebrities is private, gated and patrolled by security guards. Beach trails within the ranch are off-limits to the public. And that's the way Hollister landowners want it to stay. Last December, they and the state quietly crafted a legal settlement that would have California extinguish claims to a disputed easement within the ranch. In exchange, the Hollister owners would open up a narrow strip of beach, but only to those willing to risk the ocean journey by small craft. SUSAN JORDAN: It's completely unfair. It's unreasonable. O'NEILL: Susan Jordan is executive director of the California Coastal Protection Network. JORDAN: The general member of the public would not be able to manage this. And I would advise them not to even try to do it. O'NEILL: Joshua Brown agrees. He says the afternoon winds during his return paddle from Hollister Ranch flipped his kayak, blew his companions far beyond the shore, where surfers passing in a motorboat helped tow them back safely. BROWN: We understood the ocean, but it ended up becoming a very dangerous trip. O'NEILL: In a written statement, the Hollister Ranch Owners' Association says the pending settlement, which also expands some programs for visitors, is fair and reasonable. But coastal advocates and hundreds of Californians who wrote letters to the state call it a bad deal. A coalition of coastal advocacy groups is now challenging the pending settlement. Marc Chytilo is their attorney. He argues that ocean-only access is tantamount to no access at all. And that, he says, violates California law. MARC CHYTILO: The California Constitution and the Coastal Act provide that the public's right to access the ocean cannot be denied. O'NEILL: A local judge will decide whether to approve the settlement after a hearing in September. Meanwhile, near San Francisco, Silicon Valley billionaire Vinod Khosla has been fighting to block the beach-going public from crossing his land. After losing in the state's lower courts, the Sun Microsystems co-founder is asking the U.S. Supreme Court to hear his challenge to the California Coastal Act. Richard Frank directs the California Environmental Law and Policy Center at the UC Davis School of Law. RICHARD FRANK: Well, the U.S. Supreme Court has been very concerned about private property rights, particularly as they bump up against coastal access concerns since the creation of the California Coastal Act. O'NEILL: If the conservative-leaning high court agrees to hear the case, Frank says, private property rights could win out and limit how California manages its nearly 1,000-mile coastline. For NPR News, I'm Stephanie O'Neill in Santa Barbara County. Transcript provided by NPR, Copyright NPR.